After our brief 36 hour stop in Singapore, it was time to board another flight for another 8 hour plane ride to our next destination. Truth be told, our next destination was the whole reason we planned this trip in the first place – the stops in Tokyo and Singapore to get to this destination were just add ons along the way. But our real destination was Sydney, Australia. This would be the first time my husband and I had ever been to Australia, and actually, our first trip to the Southern Hemisphere. We planned this trip with 5 days in Sydney to see and do everything that the capital of New South Wales had to offer us. Time to finally relax, sit back and finally unpack our bags. 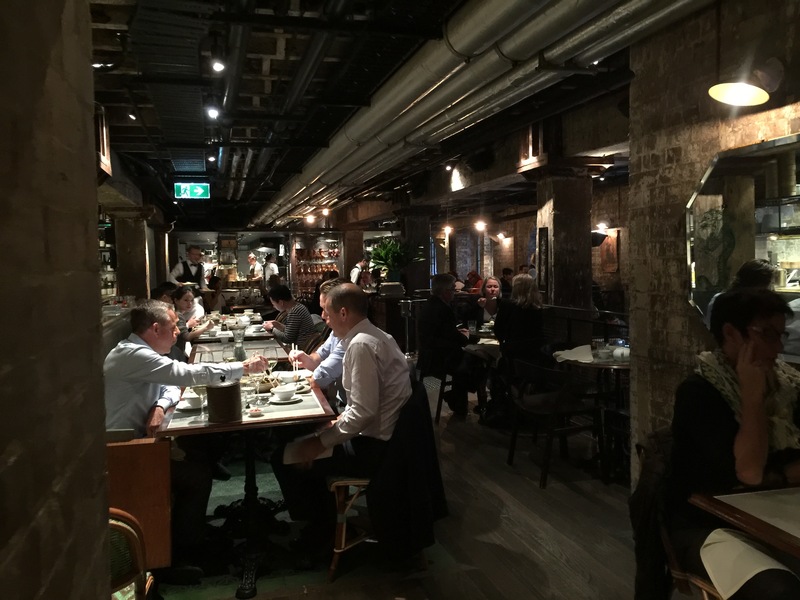 My husband was responsible for choosing a lot of the restaurants we dined at while in Sydney, and this first one, a lunch right after we landed in Sydney in the morning, was a terrific choice. Mr. Wong was located right in the middle of the Central Business District, only a few short blocks away from Circular Quay and the harbourfront area. Popular for both lunch and dinner, Mr. Wong serves up a classic Cantonese menu which is the brainchild of Executive Chef Dan Hong. As the head chef for three different restaurants in the Merivale group (of which Mr. Wong is a part of), Chef Hong, along with his head chef Brendan Fong and head dim sum chef Michael Luo have crafted an unrivaled menu combining classic Cantonese flavors and ingredients into a modern menu which has won the restaurant countless acclaim throughout Sydney for their signature style. From the time you walk the back alleys off of a busy CBD street and come to the front door of the restaurant, you’re transported back into time into a beautiful French-colonial restaurant. Large enough to seat 240-patrons, Mr. Wong, which boasts a full bar also features timber floors with inlaid tile, bamboo French woven chairs and slow turning ceiling fans. 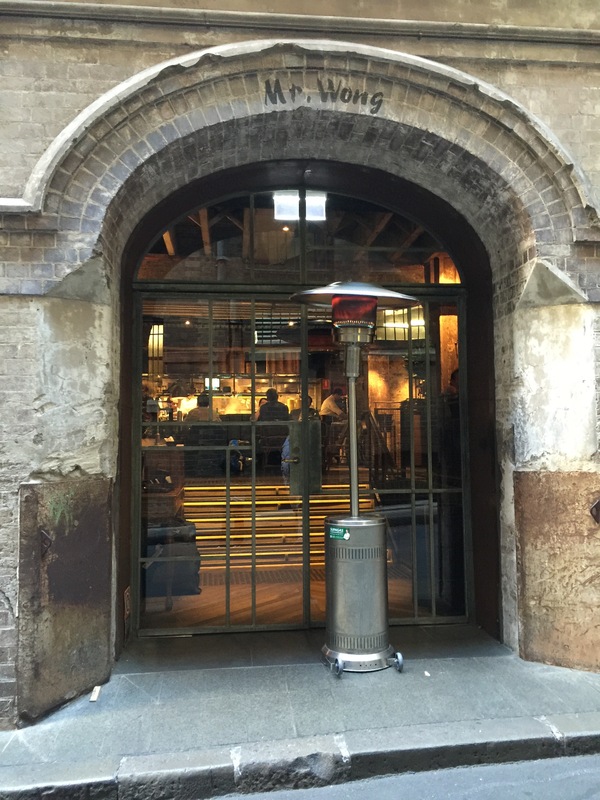 Classic stone accents combine with a dark interior strategically illuminated to set the mood and paint the picture that you’ve walked out of the modern skyscrapers and loud noise of the streets of Sydney back into time. My husband and I both felt like the restaurant was this juxtaposition of classic Chinese dim sum restaurant set amongst a 1920’s underground speakeasy. It was brilliant, and beautiful. As we were dining for lunch, the menu was much too extensive for our needs. With a menu that was a tome, we skipped all the entrees and concentrated solely on the dim sum menu so that we could sample a wide array of different small-bite dishes. Besides, you can never go wrong with dim sum, and dim sum done correctly is truly an art. Since it was only lunch time, my husband and I both decided to start with the same mocktail to enjoy with our meal, the Mr. Wong’s Tiki Sling. 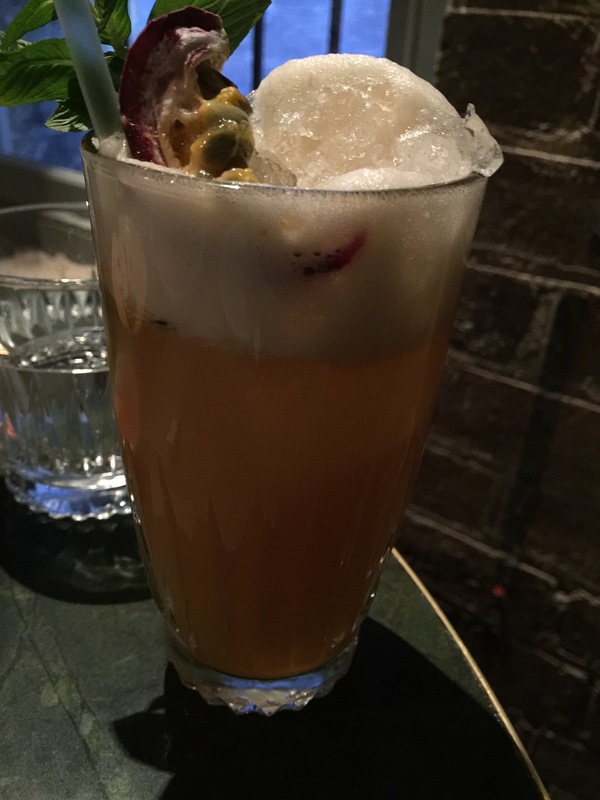 This was Mr Wong’s non-alcoholic take on Singapore’s national drink, the Singapore Sling. The Tiki Sling was made with pineapple juice, apple juice, passion fruit puree, almond syrup, lemon juice, Angostura bitters, and soda water. This was quite an interesting drink when it was brought to the table, it was almost as if it was two separate drinks mixed together. You’ve got your fruit juices mixed together and then a foamy, frothy top that never seems to settle and mix back into the drink itself. The drink is garnished with an actual wedge of passion fruit, which was kind of cool. The drink itself was fantastic, and both my husband and I really enjoyed it. The passion fruit flavor from the puree really shines through, and that was really the whole reason we chose this particular mocktail. The drink is a mixture of sweet and tangy, the sweetness coming from the apple juice mainly and the tang coming from the pineapple juice and the lemon juice. The soda water gives it the bubbly and carbonation that really brings all the sweet and tangy flavors together. The first dim sum plate we ordered was the truffle and wagyu puff which was listed under the fried and poached section of the dim sum menu. This dish was a combination of things both my husband and I love, the wagyu beef for me, and the truffle for my husband. These little puffs came out looking like works of art. The puffs looked incredibly delicate with multiple layers of thin dough fried to a crunchy crispy flakiness that was so appealing. The stuffing of wagyu beef and truffle was a flavor punch with every bite. The wagyu was so tender and the truffle flavor was powerful. It was just on the verge of being overpowered by truffle and straddling that thin line, but not quite going over it. Amazingly, these puffs were heartier than they looked, which made it all the better that the puffs were made with this amazing delicate and crunchy puffy dough to lighten the dish up. My husband really wanted to order the chive and roast duck dumpling. Any food dish with duck meat in it automatically catches my husband’s eye since he’s such a lover of duck and it’s not anything we’d ever prepare at home. 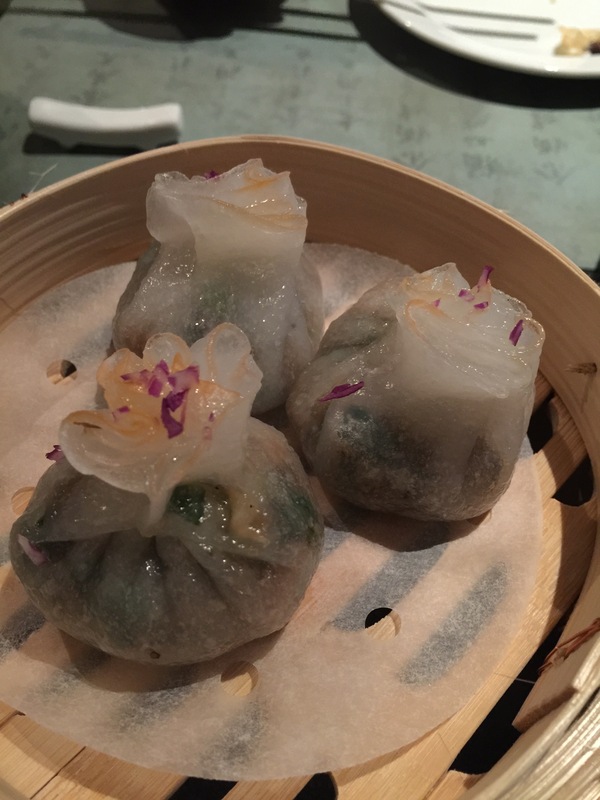 Served in a bamboo steamer basket, each order comes with three dumplings stuffed with a combination of chives and duck meat before being stuffed in dough sealed up to look like a treasure purse and steamed to perfection. The flavors of the duck were terrific and tender. The meat was rich and the chives were the perfect accompaniment as it cuts through some of the fattiness of the duck. The steamed dumpling dough was perfect as it was light and chewy and not over cooked in the steaming process. My husband really liked these dumplings. The next dish delivered to the table was one I chose, the bbq pork rice roll. 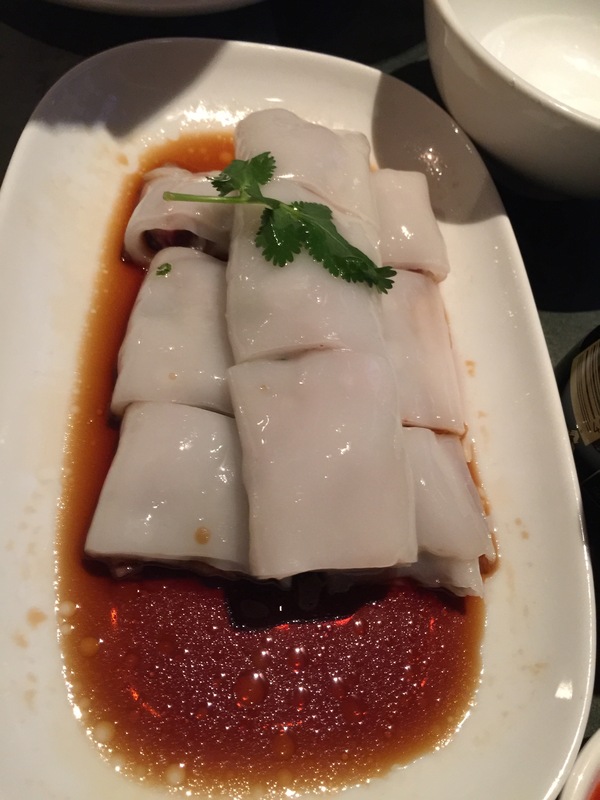 Using long flat rice noodles, bbq pork was used as a filling and the noodles were rolled up and cut into bite sized pieces and served in a light soy sauce. The noodles were perfectly cooked to be light and soft and tender. The flavor of the bbq pork was meaty and rich and full of flavor – Chinese bbq pork is one of my favorite things. And the amazing soy sauce is light and salty and really just brings the whole dish together with the soft, tender noodles and the rich, hearty bbq pork, the soy sauce gives the noodles moisture and a salty touch to round it all out. My husband was most impressed with our next dish, even though, it’s probably the dim sum dish we order most often when we enjoy dim sum. On the menu here, it was called king prawn and bamboo shoot dumplings, but it’s more widely known in Chinese as har gaw. Har gow happens to be my favorite dim sum item, and as it’s served on almost every dim sum menu, I’m always ordering it. In this case, what my husband absolutely loved was the size of the king prawn and how meaty and sweet it was. 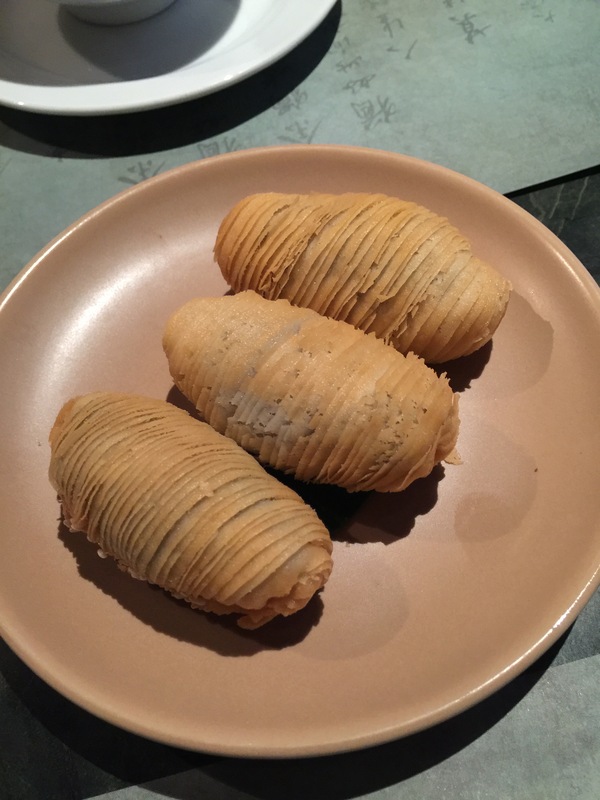 Rather than chopping up the prawn and trying to form bits and pieces of prawn meat into a ball combined with bamboo shoots, Mr Wong took a whole prawn, mixed with chopped bamboo shoots and stuffed it inside the dumpling dough. The dumpling was then steamed to absolutely perfection. The dumpling dough was thin enough that it almost became translucent once you steamed it. The fact that the dough was so thin was a positive for my husband as you can go to places where the dough is so thick you can’t taste the shrimp inside the dough because it’s so chewy. At Mr. Wong, this was the opposite. The dough was so thin that the star of the dish was the king prawn and the bamboo shoots. And believe me, the prawn was fantastic, big, hearty pieces that were tender and sweet and perfectly steamed. And the bamboo shoots were slightly crunchy and just added to the texture and flavor of the dumpling. This was the one dumpling that I ordered that my husband expected to like the least because it was the most ordinary of dumplings, and at the end of the meal, he walked away thinking about just how much this king prawn and bamboo shoot dumpling absolutely impressed him. Of course, the one dim sum item that really caught my husband’s eye, so much so that I think we ordered 3 orders of this particular dumpling (hey, there’s only 3 pieces per order, can you blame us?) was the pork xiao long bao. Xiao long bao, or soup dumplings, have to be one of the greatest items ever created. These little hand formed dumplings that are packed full of amazing ground pork and flavorful broth, it’s still a mystery how these are made. These xiao long bao were fantastic and packed full of flavor. These dumplings are meant to be one bite pockets of goodness, so that when you popped it into your mouth and bit into it, it just explodes with amazing soupy broth that is just fantastic. 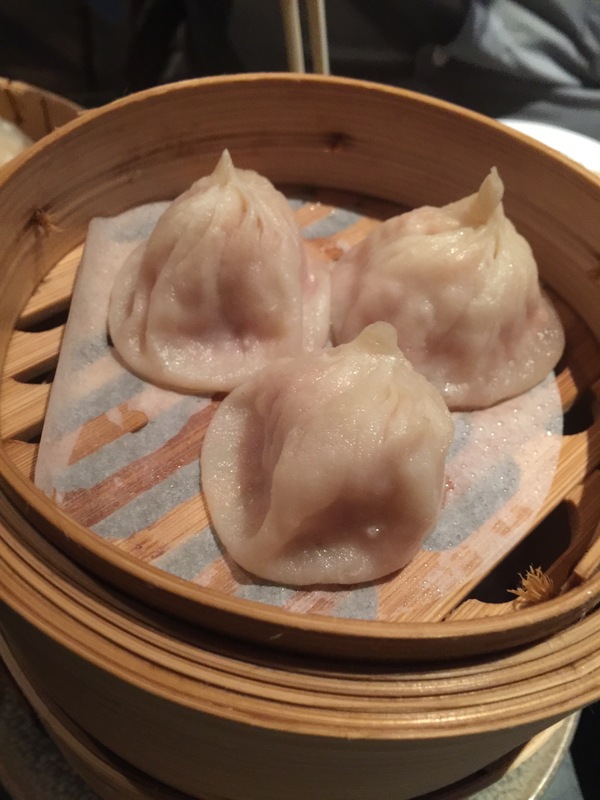 My husband and I loved these xiao long bao. I told you we ordered 3 orders of this, right? The next, and final, item on our dim sum tour of Mr. Wong’s menu was all my husband’s selection. Crispy foie gras and mushroom sticky rice ball caught my husband’s eye and he had to have some. All the menu had to say was foie gras and he was all over it. I wasn’t quite sure how foie graz, mushroom and sticky rice would all come together, but it was actually pretty amazing, and this is coming from someone who doesn’t like foie gras or mushroom. 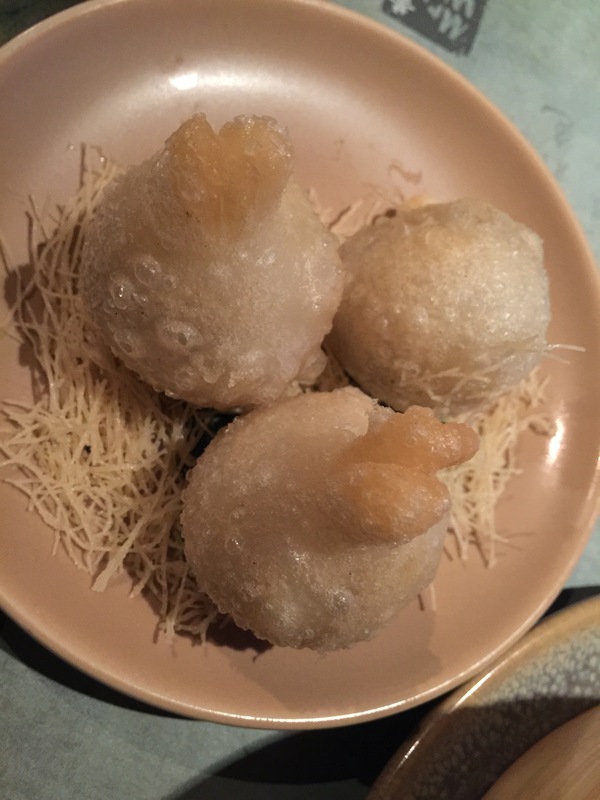 The foie gras and mushroom mixture was stuffed inside a ball of sticky rice, and then the rice ball was then lightly deep fried so that outside was nice and crispy and crunchy. The texture and feel of the crispy sticky rice was so different and interesting than I had ever imagined. My husband said that the foie gras and mushroom stuffing was rich and amazingly delicious, combined with the sticky rice, which was actually sweeter than we had thought it would be, was a great combination that combined texture and flavor into one crispy, sticky, delicious ball. This dish was actually a bit more like a savory dessert that was succulent and savory and good to the last bite. Finally, as if all of this wasn’t enough, my husband and I decided to give in and order a dessert to share. We had vacillated back and forth as to whether or not we wanted to get a dessert, but as soon as I saw the menu, I knew there was one particular dessert I needed to try. Banana fritters with chocolate cake, passion fruit and banana curd, peanuts, and milk tea ice cream. Um, yes, please? What in that dessert description didn’t sound good to you? This dessert was both visually appealing and amazingly tasty as well. 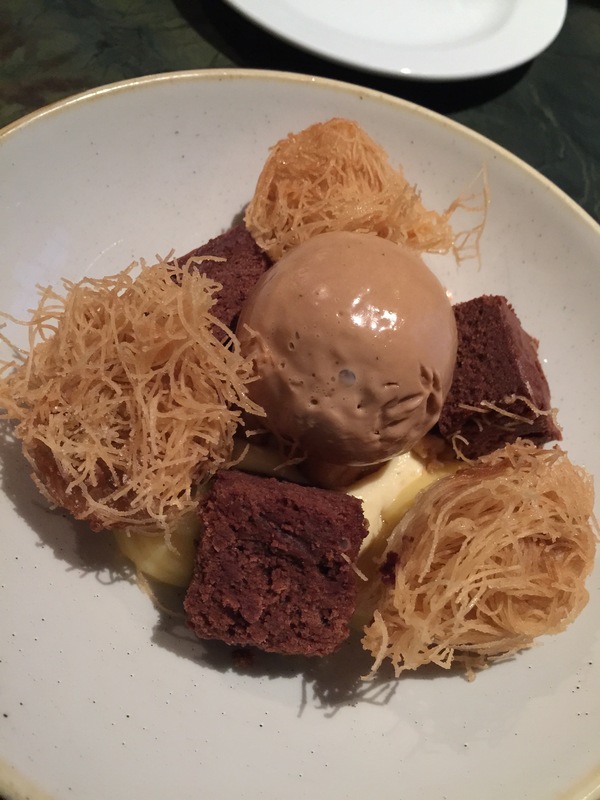 A sphere of milk tea ice cream sat atop a bed of passion fruit and banana curd surrounded by chunks of chocolate cake and fried banana fritters that looked more like a bird’s nest. This dessert was incredibly creative and different and full of different textures from the ice cream to the curd to the cake to the crunchy fritter as well as a diverse amount of different flavors from rich chocolate cake, to the cook subtle ice cream to the sweet bananas to the tangy curd. The banana fritters were actually still warm when the dessert was presented, which just added to the taste and texture of the dessert. The crunchiness of the banana fritters was fantastic and the star of the dish followed by the amazing passion fruit and banana curd. The contrast between the warm banana fritters and the cool ice cream also added to the wow factor of this amazing happy ending. This was one amazing dessert and a memorable one as well. After having flown all night from Singapore to Sydney, dropping our bags off at our hotel, and making our way to the Central Business District of the city, we were seriously in need of some sustenance. Mr. Wong hit it out of the park for both my husband and I. The setting of the restaurant was so far removed from anything I had ever pictured for a Chinese restaurant, but yet it worked and was fantastic. 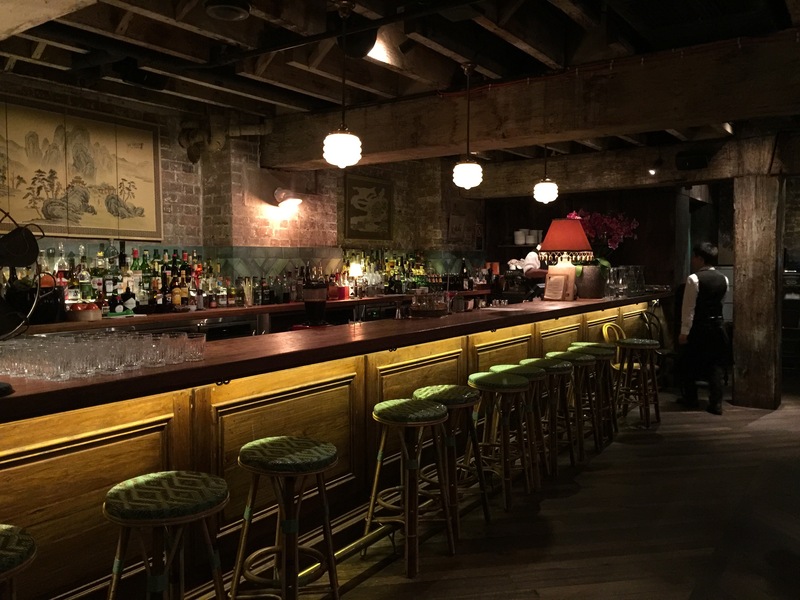 The laid back, mellow feel of this 1920’s underground speakeasy bar set the mood and the scene for what would be a fantastic lunch. The real star of Mr. Wong is the food, as it should be. The dim sum lunch was perfect as it allowed us to sample a bunch of different small bites of food. It’s amazing how full you can get from some dim sum. 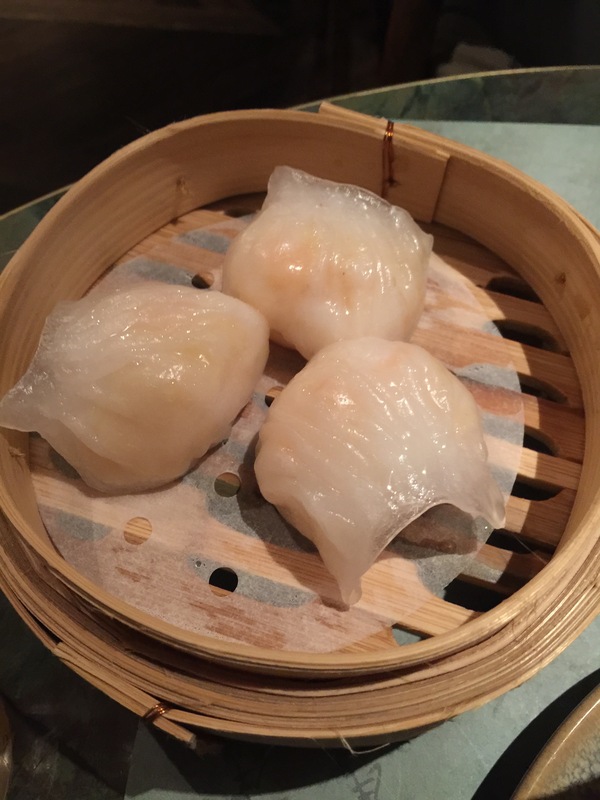 And it’s somewhat ironic that we can order dim sum dishes with foie gras and wagyu beef, and yet, the one item that most impressed my husband was probably the simplest, most common dim sum dish possible made with king prawns and bamboo shoots. Just goes to prove that you don’t always need the fancy products to make the most delicious food. 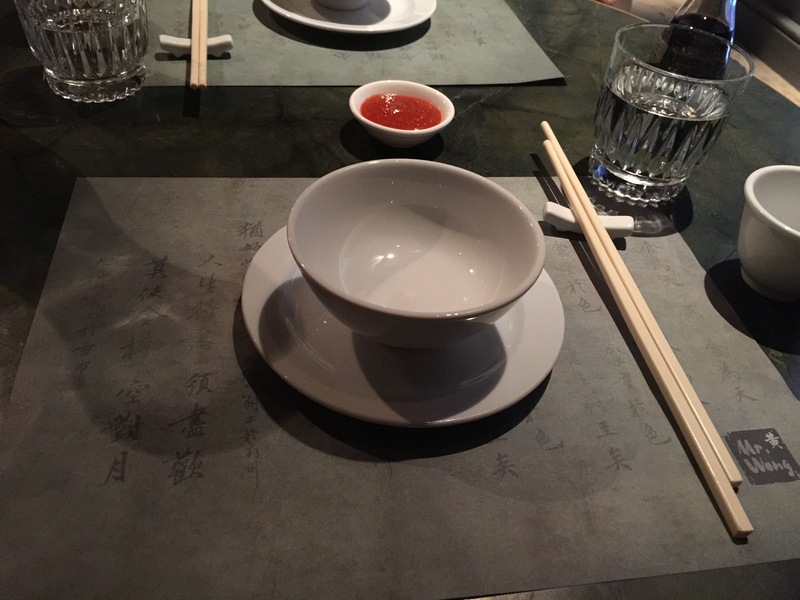 I would definitely recommend Mr. Wong for anyone who is looking for something a little different and really tasty when they are visiting Sydney. Arriving all the way and getting to eat at Mr Wong. It must be really good!